Buying shoes can be so stressful especially if you don’t know where to look to. 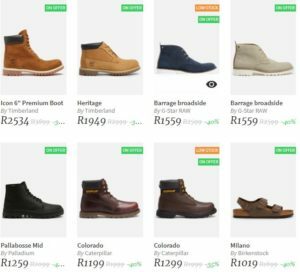 But with the recent growth of online stores, you can seamlessly buy your ideal pair of shoes from any of these online shoe stores. In this post, we take a look at the popular online shoe stores in the country. There are some of these stores that focus on shoes alone while there are others full-scale fashion stores. Easy online shopping with the hottest fashion trends, brands, BEST prices online, multiple & secure payment options with FREE, fast delivery anywhere in SA!. Step up your shoe game with the widest selection of footwear all under one virtual roof! Zando speaks shoes and now you can get footwear for the whole family at one destination. Proudly South African footwear company, creating fashionable footwear that is affordable. The brand aspires to be part of SA’s leading footwear companies. You can get a wide range of women’s shoes to buy online at Shoeperama. Pumps, sandals, wedges, comforts. A range of sizes. Free Shipping possible!. You can check out their selections on their site. Step Ahead online store provides customers with Quality women’s shoes, Leather shoes and handbags. They also have Men’s shoes in stock. They have made online shopping easy with free delivery and free returns. Large sizes of all types of shoes are also available. Buy men’s shoes online! Men’s Shoe Centre stocks a wide variety of shoe styles and brands. Find out about free delivery, and shop by style, brand and size. Men’s Shoe Centre stocks extensive ranges of the biggest shoe brands from Adidas to Skechers, and everything in between. Find the brand name that takes your fancy by visiting their website. Superbalist.com is South Africa’s biggest online shopping destination for fashion and apartment picks delivered to your door. They feature fashion for men and women from 500+ international and local brands. From workwear to sweats and off-duty staples, formal and casual attire, our online fashion selection will have you serving looks at every occasion. Running errands or just lounging at home calls for maximum comfort and our casualwear from the likes of daily Friday, basic thread, Missguided and Jack & Jones offers loungewear with all the comfort as well as style. Shop Joggers, basic T-shirts, vests, leggings, jeans and knits to update your casual repertoire. A staple pair of sneakers like Vans, Reebok and Adidas in solid black or white will easily become your go-to footwear option for casual ensembles. Offering a wide selection of shoes for the whole family! Quality local and international brands at the best prices! Free shipping for orders R450 and above.